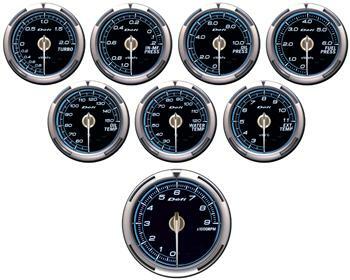 Defi Link Meter Advance C2 UNIVERSAL - Dezod Motorsports Inc - Home of the automotive performance enthusiast since 2002. Defi-Link Meter ADVANCE C2 is a gauge series which needs to be connected to Defi-Link ADVANCE Control Unit. ADVANCE C2′s dial are not visible except the biggest tick marks until the ignition is turned on. Turbo/in-mani, oil press, fuel press, oil temp, water temp, exhaust temp, and tachometer are available. Defi-Link ADVANCE Control Unit (sold separately) is necessary to operate C2 gauges. ADVANCE C2 is a limited sale for one year until June, 2014.